Hardback. SIGNED. 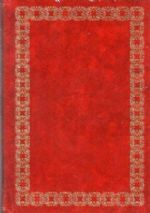 In two parts : Part I 1888-1972 which features views expressed and material published, including the memoirs of officials and police officers etc. Part II 1973-1975 includes attempts to consolidate the case against Druitt and demolish that against the Duke of Clarence. With Bibliog. and Index. 174pp. 12mo. h/back. With tipped-in label SIGNED BY RICHARD WHITTINGTON-EGAN. With previous owner's name/date insc. to fep + tiny 'Wildy' label to fpd o/w Nr. 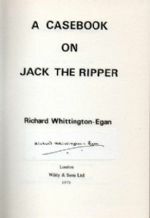 F. A lovely copy of a scarce and sought after Jack the Ripper title - particularly signed.